Damn, it’s the classic dilemma: I took a hella pile of photos in San Francisco last week, but Lord knows if I’ll have enough time in the next couple of weeks to cull out the winners, tart them up, and put ’em on Flickr. But my big excursion on my final day of the trip was cool enough that I wanted to make damned sure I posted Saturday’s pix. The genial man in the above photo is Ranger Craig of the National Park Service. 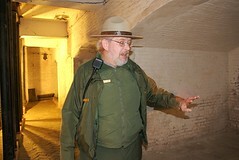 He’s stationed at Alcatraz Island and he invited me up for a tour. Mind you, it’s not like it’s all that hard to get a tour of the island and the prison. It turns out that it’s a national park, you know. But by (happily) agreeing to help the National Park Service with their plans to start up an Alcatraz podcast, I was magically elevated from Tourist to Guest Of The Park Service…and thus after a half-hour’s consulting in the ranger office, Ranger Craig was able to take me into parts of Alcatraz that are off-limits to the casual visitor. So! Check out the photoset. But not now…wait until tomorrow, when you’re at work. There are about 60 pictures and you’ll be able to kill a solid 15 minutes. Hey folks- this is why I love AICWoB so very much. MacWorld & Alcatraz Prison. There is a metaphor or an analogy or a witty Burt Lancaster/Steve Jobs joke in here somewhere– I’m just too gobsmacked by the sheer breadth of AI’s quizzical eye to see it. The man is a veritable Enoch Root. Hey, I know that guard! That’s Vicki! I found your photo set via Metafilter.com. Thanks a bunch for posting them – I found them very interesting. I enjoyed even my run of the mill tour I had of Alcatraz a couple years ago, so this was a great expansion on that. I’ve seen this so-called Alcatraz Flickr photoset and it was wonderful. Andy, your post brought back great memories of a 2001 visit to SF and MacWorld where I partook in the particularly touristy activity of visiting “The Rock.” I don’t generally do such tours but it was so worth it. Thanks for putting pix of things most of us will never have the opportunity to see. The Alcatraz Catacombs = kewl beans. Previous PostPrevious Now THAT’s more like it!